The short answer is obvious; to live. As an athlete, your needs for proper hydration go beyond just supporting life, you need to support your performance. Dehydration causes excessive stress to the body including raising metabolism (which could lead to bonking sooner than planned), increasing perceived effort, upping heart rate, and decreasing cognitive awareness. While some athletes can tolerate dehydration better than others, losing more than 3% body weight while training can lead to decreased performance for anyone. This decreased performance from dehydration takes a larger toll in hot vs. cool temperatures, which is why it is increasingly important to take in fluids during sweaty summer days. Did you know that lean tissue is made up of more water than fat tissue? Meaning leaner athletes can typically tolerate dehydration better than their less lean competitors. Just another reason to focus on overall health and body composition for athletic performance! Managing hydration status should be a daily effort. To do so, weigh yourself before and after workouts to gauge sweat losses, check your urine throughout the day for a pale-yellow color, monitor any muscle cramping, and take note of generally energy levels as dull fatigue can be a clear sign of chronic dehydration. Day to day, it is important to be consuming water rich foods as well as taking in fluids consistently. It is crucial to go into your events well hydrated. To do so, take in 2 cups of fluid 3 – 4 hours prior to your event. This time span allows for voiding of any excess fluids before the workout begins. Immediately prior, take in another ½ -1 cup. The general recommendation is to take in ½ - 1 cup of fluids every 20 minutes. Depending on your body composition, sweat rate, the weather, clothing worn, etc… this may or may not work for you. The best thing is to take frequent sips consistently throughout your workouts to prevent dehydration. For endurance athletes training 3 or more hours at a time, it becomes more important to know individual, specific needs to adequately match intake. To replenish lost fluids, aim to take in 1-2 cups immediately post workout. 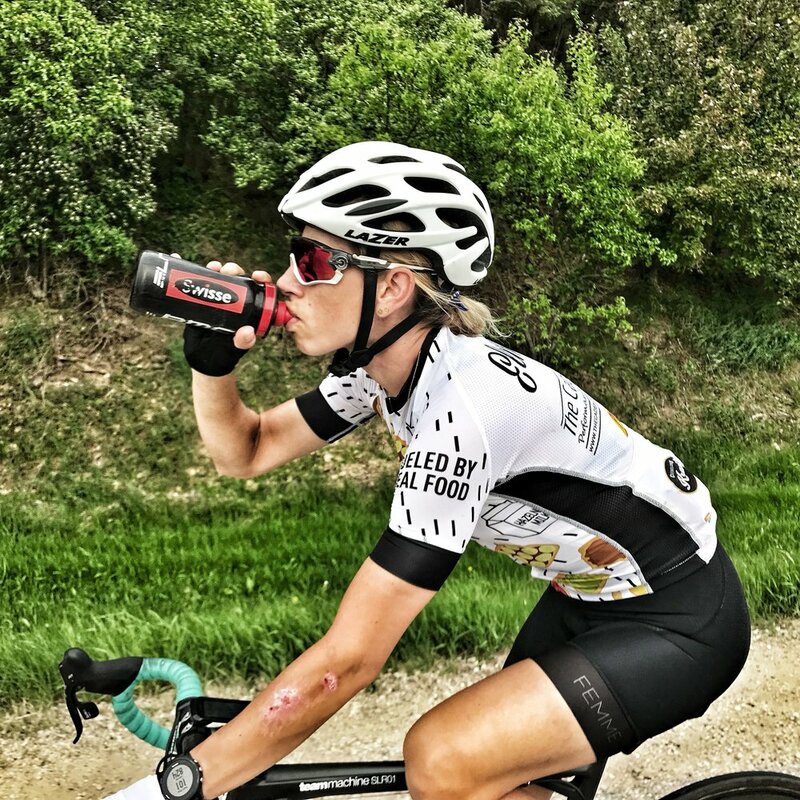 In hot conditions, very intense training sessions, or when there is a small time gap between sessions, you might need to be more aggressive about replenishing and rehydrating. Aiming to take in 1.5 times the amount lost will help. Also, focus on eating water rich foods and drinking regularly until the next training session. To cool the body before workouts on extra hot days, blend your fluids with ice and consume it slushy style. Scientific studies have proven this works! This may sound obvious, but make sure you test a range of drink flavors to find one you like. Too many athletes take a drink they think they should drink, but hate the taste and end up avoiding it. Water is the primary fluid you should be taking in on a day to day basis. However, water may not be enough to replenish hydration needs. When you sweat, you also lose electrolytes including sodium, potassium, calcium and magnesium. When sweating is high and or the athlete is a known salty sweater, it is important to replenish sodium losses in addition to fluid losses. Adding salt tablets, table salt or using a mix with sodium is an easy way to do this.If you only take in water, you risk over diluting these trace minerals which frequently leads to cramps, confusion, and delayed muscle response. My go - to electrolyte picks are KLEAN HYDRATION & LYTEZONE. For workouts that require energy intake in addition to fluids, choose a beverage with added carbohydrates. Aim for mixes with around 15g of carbs/ 8oz of fluid. Consuming a drink that is more saturated with carbohydrate can lead to GI distress. Caffeine is a popular topic when hydration is addressed. While this is a topic in itself, in short, caffeine will not lead to dehydration. Caffeine affects everyone different, so while some might see performance enhancement from it, others may experience negative side effects such as anxiety, heart palpations, or higher risk of bonking due to increased metabolism. To avoid gut distress from carbonated beverages (many athletes turn to cola for a mid workout boost) allow the drink to go flat before using them in training. · Homemade sports beverage – see recipe below. Making your own version is cheaper and allows you to tailor your drink to match your needs and preferences. · Coconut water – this drink is rich in potassium which helps support organ function but sodium levels might not be enough to replenish needs during a workout. See the recipe for my ideal way to include this tasty, tropical drink. · Cold Brew Slushy – try blending cold brew with vanilla almond milk and ice for a cooling, caffeine boosting pre workout drink. · Soups – think out of the box with your recovery! Sipping broth post workout will aid in replenishing fluids as well as sodium and other minerals. Bone broth has protein that can help repair beat up muscles, but don’t forget to toss in some rice or pasta for those post workout carb needs. · Nuun Tablets – dropping one of these into your water bottle is an easy way to add electrolytes to workouts that don’t require additional calories, or if you prefer to eat your carbs over drinking them. · Juice – with 26g of carbs per cup juice is an easy way to get fast acting energy, however most athlete guts will benefit from dilution this with a 1:1 ratio of juice to water. · V8 – is a vitamin, mineral, and sodium rich beverage. While it might be an ideal sport beverage, don’t force it; athletes love or hate the taste! · Mineral Water – enhance your tap by sipping on mineral enriched water. This water provides a good amount of calcium, magnesium and other trace minerals. While there’s no documented benefit of drinking fancy bottled waters, if you like a particular type, you are more inclined to sip it more often! Drink up!